In the second of our series, it’s time to take a look at how I’ll be mogging my Warlock come the (potential) awesomeness that will be 4.3. Dressing a bunch of alts is proving quite a problematic exercise, if truth be told and I’m doing my best to find a different approach to each outfit. 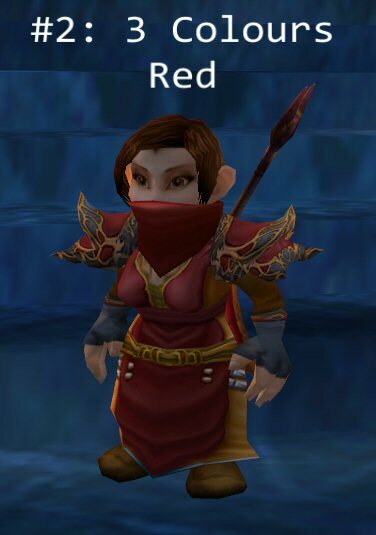 This one began with the mask, which I picked up whilst doing Archaeology on P, which is pretty rogue-ish but as cloth is only suitable for casters. I decided to go for a quite complicated visual ensemble yet all of these items were sourced from my server’s AH in the space of an hour. Mogging does not need you to step foot in an instance. Side on, we see the predominant colours in this ensemble. The weapon on this outfit is the only thing I’m not 100% happy with and I think I will be doing some further investigation of the numerous online resources that are popping up for mogging options to find something a bit more impressive. 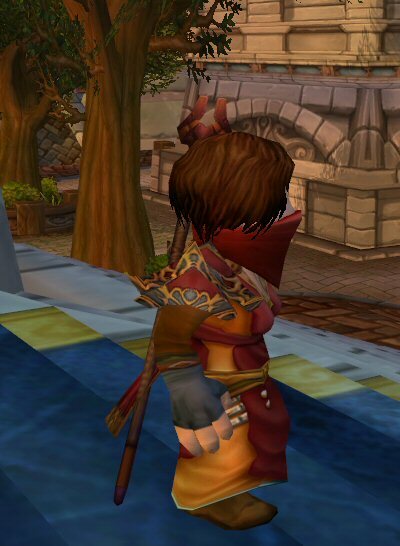 Weapons are, I am finding, a great starting point for mogging and my druid has something utterly wonderful in that regard to use… but more of that as we go. For now, here’s a list of the items I’ve used in this outfit for reference. Roll on the 4.3 PTR!